Jackie Du is a painter and textile artist who is pursuing a Master's in Art Education at City College of New York. Jackie joined Creative Art Works in 2017, when she taught the after-school Wearable Art program at Hamilton Grange Middle School. She is currently teaching a drawing and painting curriculum inspired by modern and contemporary artists at the ACS Children's Center, a temporary housing facility for kids in the New York City foster care system. CAW is providing art programs at Children's Center to two age groups: kids ages seven to twelve and teens ages thirteen to eighteen. Jackie primarily works with the younger children. We asked Jackie to share some of her experiences teaching at Children's Center with us. Kids at Children’s Center are smart, kind and loving. And like most children their age, they can become upset or distracted, yet these children remain resilient and they persevere. Unlike other children, they stay at this facility for a few days, or much longer, depending on the circumstances. For some children, foster care has been their reality since day one. The kids here are curious and eager to share their knowledge and interests at every opportunity. Their desire to create is so palpable that children often find their own way into the art room before and after classes. Christopher* is one of the kids who come to the art room. Christopher is a curious, intelligent child who just turned 13. He loves food, sports and the freedom to play, and likes to share his artwork with his peers and adults. His painting of a playground captures a lot of his interests and personality. One day, after class ended, there was a loud commotion out in the hallway. There was some sort of fight or argument, and I could hear some adults trying to talk to Christopher, but he couldn’t calm down. A little later, he burst into the room asking for paper and crayons. So, I gave him some paper and a box of crayons and had him sit at a table while I continued to clean up. After a few minutes, I asked Christopher if he wanted to show me his drawing. What Christopher had drawn was a commotion of gray, red and yellow lines. 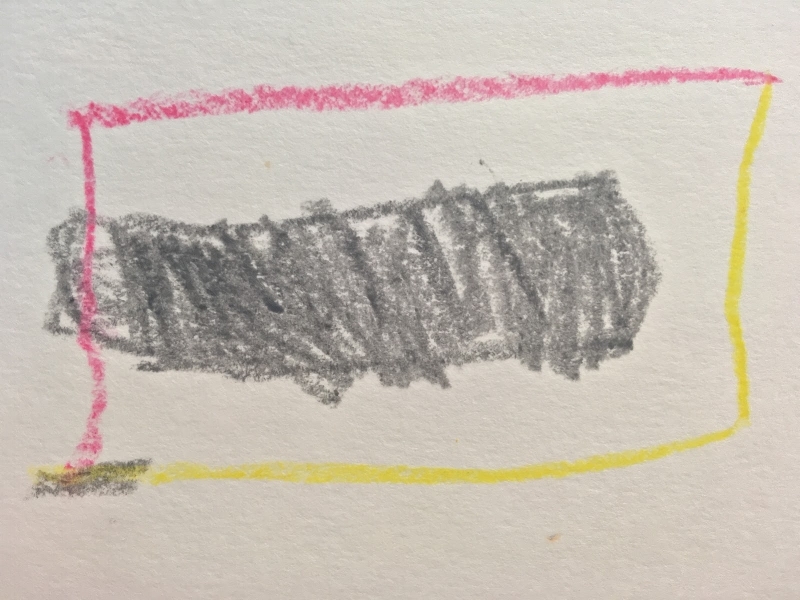 Christopher explained to me that the gray lines represented sadness, the red represented anger, and the yellow represented confusion. He said his feelings were all mixed up bouncing around inside of him and that he didn’t know how to control them. I suggested that he try making a second drawing, only this time, he should try separating the colors and maybe giving them shapes. I went back to my cleaning, and when I checked in on him next, he had made some remarkable decisions. Nothing about this drawing was accidental. He had drawn a gray rectangle in the middle of the page where it made sense to him. He had drawn a box around the rectangle, half in red, half in yellow, with a little patch of gray connecting a corner where the anger and confusion met. And a bit of the gray box of sadness still poked through the anger. Christopher had used what he had learned about color in a previous class to express what he was feeling. And then he was okay. Christopher left the room with calm energy and was able to go back and join the group. Having access to art materials and a space to work though his feelings in that moment allowed him to develop a sense of self-understanding. During class last Tuesday, Matthew and Angel* were sitting next to each other. The prompt that day was to imagine a room of your own from a bird’s-eye view. What would you put in your room? Would it have a big TV or an ice-cream maker? What color would it be? At one point, Angel had to leave the room briefly, and when he came back, he was clearly upset. All the other kids came over to comfort him. By this point, Angel was still working on his drawing, while most of the kids were already painting. Matthew took upon himself to explain the painting techniques he had learned while Angel was out of the room. This included working wet on wet and using a resist process with oil pastels. He even showed Angel how to use a paper towel to soak up puddles of paint, which was a technique he had discovered through his own creative process. I learned from watching this that children continuously apply their intelligence at every opportunity they get. Every class ends with an appreciation circle. We put the art up on the wall and everybody gets a chance to talk about it if they want to. I have a list of sentences starters taped to the door that kids can refer to help them frame their comments. These include, “I see…” “I’m curious about…” and “I am inspired by…” The children relish in that time to share. They can be proud that they have put a part of themselves into their art. Children have an immense capacity to demonstrate care for one another when given space to do so. What I have found most inspirational is that art-making allows children to be tender with themselves, and courageous with their ideas.